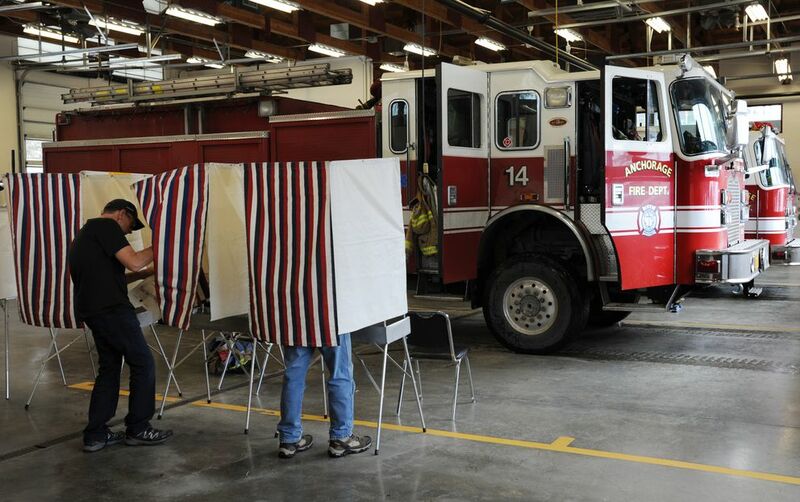 Almost 80 percent of Anchorage didn't vote in the election. Here are some of the reasons why. Laura Zabriskie didn't vote in Anchorage's local election this week — on purpose. Zabriskie said that after the 2016 presidential race, she couldn't handle the stress of another election. "I'm just politicked out right now," said Zabriskie, a 47-year-old Eagle River artist interviewed outside Middle Way Cafe around lunchtime Thursday. A third-party voter in the national November election, Zabriskie said she was repulsed by the drama that surrounded the election of Donald Trump and the violent protests that followed. Zabriskie was one of the large majority of registered voters in Anchorage who, for one reason or another, didn't vote in Tuesday's municipal election, making it one of the lower showings in the past decade. 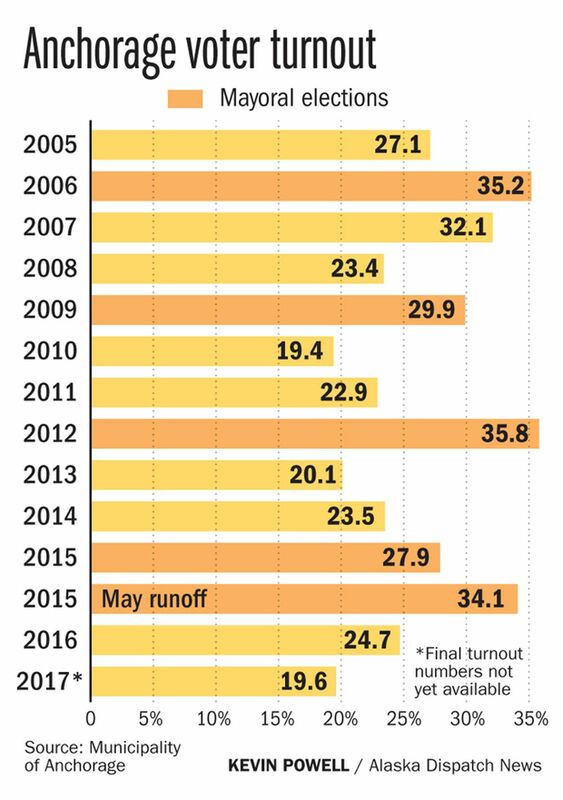 Turnout has long been identified as a key problem with local races. While elections officials in Anchorage still have absentee and questioned ballots to count, turnout for the 2017 election is expected to land below 22 percent of registered voters. Since 2005, it has ranged from 19 to 32 percent in non-mayoral years, like 2017. Elections officials have cited low turnout as a main driver for shifting to a system of voting almost entirely by mail in 2018. 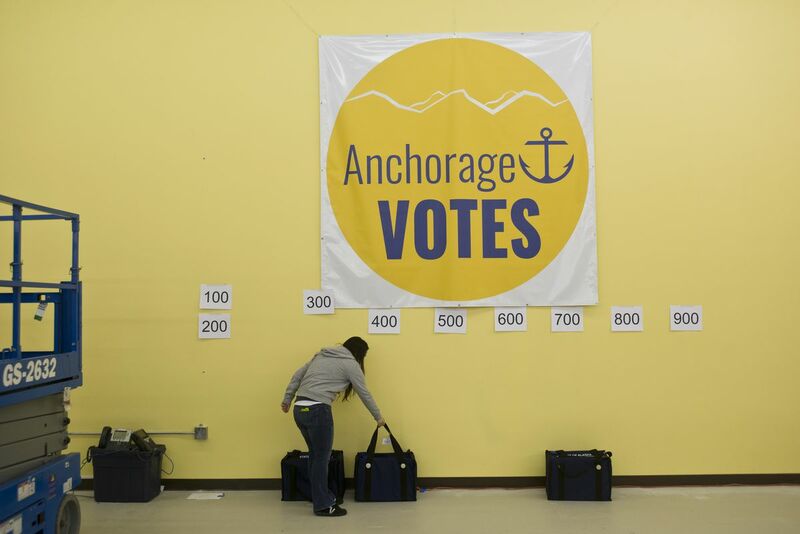 This week, Alaska Dispatch News interviewed Anchorage residents who were among the city's nearly 170,000 registered voters who could have gone to the polls this year but didn't. Some said they didn't know there was an election. Many other non-voters had reasons for not filling out a ballot. They said they were too tired or too busy or didn't have enough time to read up on the issues or felt little enthusiasm about the candidates. Others, like Zabriskie, felt worn down by national politics and were consciously avoiding the polls. Zabriskie has voted in municipal elections in the past, she said. But this year she just didn't feel like the issues addressed on the municipal ballot affected her, or that she needed to voice her opinion. Her boyfriend did vote, she said, because he pays property taxes. The voters who did show up on Tuesday supported most of the city and school bonds that will raise taxes on property owners. A majority also decided to keep in place a law that will expand the city's pool of taxi permits. They selected candidates to fill six Anchorage Assembly seats and two Anchorage School Board seats, affecting the direction of decision-making for years to come on budgets and other issues in city government and the state's largest school district. Still, Arturo Martin, 52, said he didn't have any interest in the Anchorage election. He generally doesn't. "I usually just vote in the national elections, like for president. But for some reason I never vote locally," he said as he shopped for produce at Red Apple Market in Mountain View early Thursday afternoon. "I knew there was an election, but I didn't know who was running or what they were running for." Martin said he recently moved from Muldoon to South Anchorage. While he saw campaign signs dotting the sides of roadways throughout the city, he said he never received any phone calls from candidates. No one ever knocked on his door. He didn't recall getting any flyers in the mail. The Anchorage election just didn't seem as in-your-face as the presidential election, he said. "There was not a lot of stuff going on to encourage you to vote," he acknowledged. "You see all the signs, but it's nothing that moves you." Others said they simply had no interest in what was on the Anchorage ballot. One woman outside of Middle Way Cafe in Midtown said she got the voter guide in the mail and put it in the recycling bin. "Too many other things going on," she said, and walked away without giving her name. Another woman picking out a box crackers at the Carrs next to the Northway Mall in East Anchorage said she "had no good excuse." "I was just tired. I just didn't make the time," she said. "It was just one more stop in an already busy day." She declined to give her name. Chris Goodrich, a 37-year-old Costco employee, was born and raised in Anchorage, but he's never once registered to vote. He has philosophical reasons for that, but he also said he hasn't been strongly motivated by any issue on a local ballot. "Nothing really grabs me," he said. If one issue or candidate did, he said, then he'd head to the polls. Raymond Carr's excuse: He just missed the election entirely. "I didn't know when it was," Carr said, walking out of the Value Village on Dimond Boulevard with a pair of comic books in hand. Carr, a 43-year-old airport employee, also said he hadn't followed any of the local issues closely. He knew there was something about taxis on the ballot, but that was about it. He said he tends to vote in presidential elections and state elections and is more worried about the future of the Permanent Fund dividend. But he doesn't usually vote in local elections. At a table in the Carrs grocery store at the Northway Mall, Robert Cutler, 48, was eating lunch and said he voted in the presidential election, but not in the local one — usually never in the local one. "I never have been proactive there," he said. "Probably should be, but for whatever reason I have other priorities in life. So I'm not fully doing my duty there, I guess, as an Alaska citizen." Alyssa Culver also didn't vote. But she said she felt really bad about it. The 23-year-old was walking up to the Costco on Dimond Boulevard Thursday with her two toddlers. "I'm a very impassioned voter … and I didn't even realize (it was election day) until half the day was up, and I had already picked up my kids," she said. Culver said she thinks local elections are important. But she also admitted that since the presidential election, she's more tuned out of politics. Culver wasn't alone with a sense of political burnout. A 51-year-old Chevron employee sitting at a table in the Carrs grocery store next to the Northway Mall said she didn't vote because she was tired of politics and distrustful of politicians. She said she worried about the state cutting PFD checks, a money-saving measure that she felt most Alaskans opposed. Given national and state politics, she said she felt Anchorage residents put the municipal election "on the backburner." "I think everyone is just tired with what's going on with the presidency and dealing with Gov. Walker and the PFDs and all the changes that are coming," she said, declining to give her name. "I think everybody is just throwing their hands up — that's how I feel. I just feel tired of it all." Teresa San Miguel, a 31-year-old medical receptionist, did not vote Tuesday. But that wasn't for a lack of interest. Looking guilty, San Miguel said she ran out of time to do her research. She felt she wasn't going to make an informed decision. "I've voted before … I just, I don't know. It seemed like, boom, all of a sudden, it was election day," San Miguel said, standing outside of Middle Way Cafe. This year, San Miguel said, it seemed more difficult to find information about the candidates and ballot measures. At that moment, her mom, Teresa L. San Miguel, walked up to meet her daughter for lunch. Asked if she voted Tuesday, the elder San Miguel, who works for the U.S. Postal Service, hung her head. She said she realized it was election day about an hour before the polls closed. She usually votes and could have made it, she said, but she just decided not to.